Drill bits are handy tools, especially when it comes to piercing through materials or creating holes. But, using them over time can cause drill bits to become dull and you’ll end up having to buy new ones. Some shops have their own drill bit sharpener, which saves them money. However, if you’re still a beginner in doing these kinds of work or you just happen to be a small shop owner, a standard drill bit sharpener can cost you around $259, which is pretty expensive. So, is it still possible for you to sharpen your own drill bits at your own pace and comfort? The answer is yes! With simple yet innovative materials, you can easily start on resolving the dullness of your drill bits just by using a block of wood as the pedestal jig and a pedestal grinder. If you’re still unconvinced, then you can watch this video and start doing it yourself! 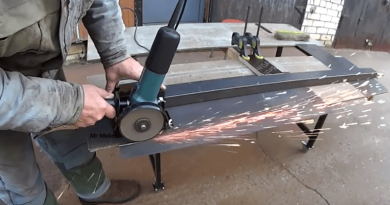 Move on to the Next Page video: Sharpen Your Own Drill Bits! – Save Money! It’s Easy! ← Make Your Old And Used Furniture Look New By Refinishing.